Exploring the wilderness of South Caicos by Jeep Wrangler. Explore the Beautiful South Caicos! 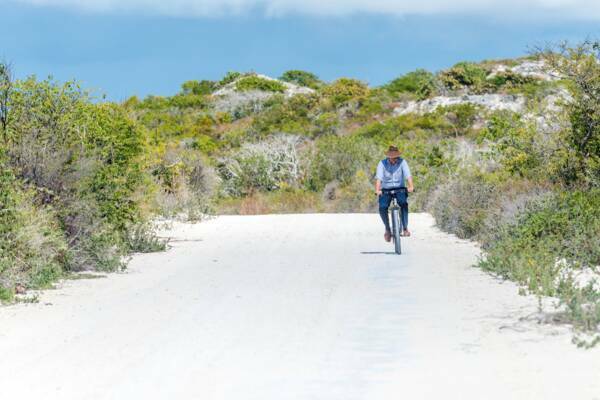 Much of South Caicos is flat and perfect for exploring by bike. South Caicos offers a different experience than many other islands, with a combination of an authentic Old Caribbean fishing town and two luxury resorts. There’s comfortable accommodation, yet much of the island offers an tropical atmosphere that’s untouched by tourism. Many of the island’s land activities revolve around fun ways to explore, be it by bicycle, ATV, or jeep. 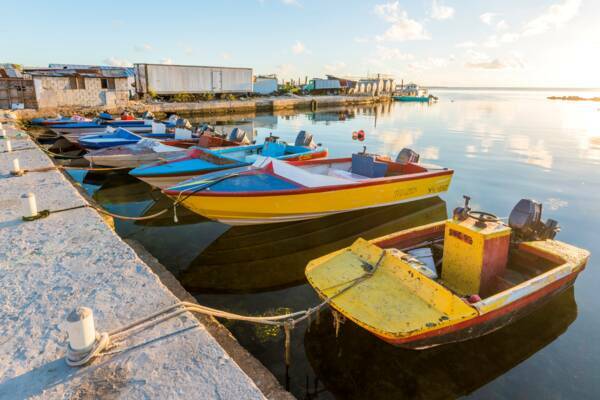 There are countless vistas and beaches to discover, and many small yet interesting sights, including the unique Boiling Hole, the old Bermudian style buildings in Cockburn Harbour, and the salinas and wetlands that teem with birdlife. South Caicos features two luxury resorts, which offer several land sports and activities, including tennis, volleyball, cycling, and relaxing spas. The Caicos Islands support a menagerie of birdlife, and South Caicos is one of the best bases in the country for a serious birder. On the island, the long abandoned salinas, from the old sea salt industry, are a haven for a wide array of wading and coastal birds, including the Caribbean flamingo, several types of egrets and herons, pelicans, and more. The small uninhabited cays surrounding South Caicos offer even more potential. The red mangrove cay of Moxy Bush is a frigatebird rookery, the channel cays north of South Caicos support the greatest osprey populations in the Turks and Caicos, and the long and winding mangrove estuaries near East Caicos support large populations of tri-coloured herons and reddish egrets. Colourful fishing boats at Cockburn Harbour on South Caicos. The island is great for outdoor and travel photography. South Caicos is also a great destination for wildlife, travel, and landscape photography. The island combines elements of the historical sea salt industry, old Caribbean buildings, birdlife, coastal scenes, and secluded beaches. One of the most picturesque spots in the entire Turks and Caicos archipelago is the Plandon Cay Cut region on the far northern tip of South Caicos. Here, small uninhabited channel cays, sand bars, and incredibly-varying water colours create spectacular vistas. The isolated Highlands region of South Caicos is another fascinating area. There’s the ruins of the old Highland House, hidden bays, coastal cliffs, and marine wetlands. Long Cay, an uninhabited national park island located near South Caicos, is another amazing spot. The barrier island consists of narrow bluff ridge, and the contrast between the deep blue water on the east side of the cay and the shallow turquoise Caicos Banks to the west is breath-taking. On the cay is a significant population of the critically endangered and unique Turks and Caicos Islands Rock Iguana, a large and friendly lizard that is quite approachable. Bird life is also abundant and includes ospreys, long-tailed tropic birds, and brown noddies.